Act now – Save big! With a grim reminder of the fragile state of our electricity grid over the last week or so , we all need to act – and act decisively to cut our electricity usage. ESKOM has requested that consumer cut their usage by 10% – well , we are going to do better than that! Geyser timer and Blanket – saving 20%-30% monthly. Installing a geyser timer and geyser blanket can save you between 20% and 30% on your monthly electricity costs – and that IS WELL ABOVE the 10% target set by Eskom. Energy saving shower head – Saving 10% monthly. The E-Shower from Oxygenics is the showerhead on offer with this package. If you are currently using a showerhead that is like the Niagara Falls (click here to find out how to measure your shower’s flow rate), then you can make a huge difference to both your pocket and the planet for minimal effort. Over 2 tons of carbon emissions, which is what you would save if you didn’t drive your car from January to August. This offer applies to the major urban areas of Johannesburg ; Pretoria ; Cape Town and Durban. Areas falling outside of these may incur additional courier fees and travel costs – we will quote you prior to confirmation. The price includes full supply and installation of the timer and blanket by our specialist installers and will include a geyser timer housing -if required. The Shower Head is the E-Shower From Oxygenics only and will be delivered by Courier within 48 hours once ordered. Payment for the Ultimate Energy Saving Bundle must be done in full in advance,as this is a first come, first serve offer only. By completing the form below, you are ordering this bundle and you will receive an invoice for payment by email within 24 hours. Ensure you fill in the address details correctly as this will be the address that the shower head is delivered to. We accept no liability for incorrect addresses given and any costs incurred due to address error will be for your account. Once payment is made, you will be contacted by the area specialist to arrange the installation of your timer and blanket. You will receive an email with the tracking number of your shower head within 24 hours. The price is per geyser and you may order more than one package and shower head. Additional shower heads can be ordered if required. 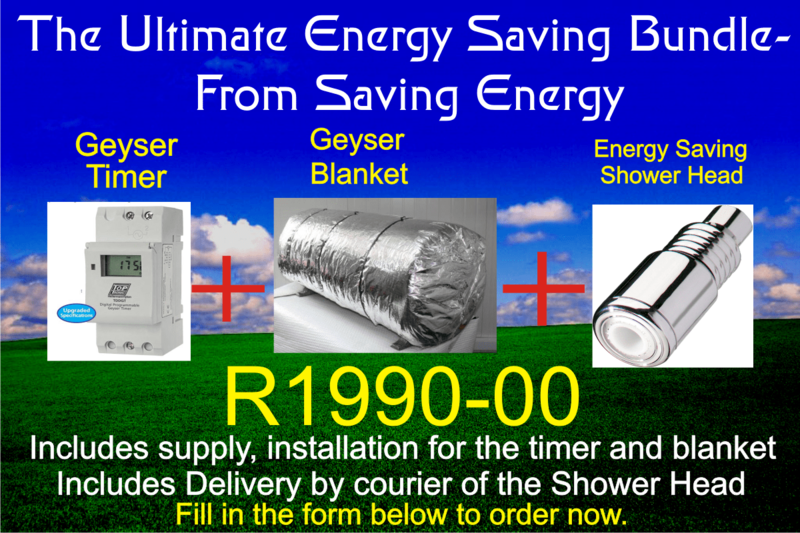 If you have already had a timer and blanket installed by Saving Energy , you can order the Energy Saving Shower Head for just R350-00 including delivery by courier by filling in the form below and selecting the “E Shower” option.